I’m excessively fond of stories involving occult detectives or psychic detectives. This type of story had a considerable popularity in the early 20th century, although by the 1920s the vogue seemed to have run its course. The best-known psychic detectives are of course William Hope Hodgson’s Carnacki the Ghost Finder and Algernon Blackwood’s Dr Silence. Also worth reading are Kate O’Brien Prichard and Vernon Hesketh-Prichard’s Flaxman Low stories and Sax Rohmer’s tales of the Dream Detective. One of the lesser-known examples is Aylmer Vance, created by Alice and Claude Askew. I know virtually nothing about the authors aside from the facts that they were married in 1900 and apparently both died in 1917. The stories are all set in England so I assume the authors were English. If there’s one thing that annoys Aylmer Vance it’s being referred to as a professional. He is a dilettante, and proud of it. It’s worth remembering that the word dilettante did not always have a pejorative connotation. Aylmer Vance investigates strange events, such as haunted houses and other phenomena that do not appear to have a rational explanation. Any good detective has to have a Dr Watson, and Aylmer Vance’s Dr Watson is Dexter (who also serves as the narrator of the stories). Dexter is a barrister. He has clairvoyant powers although he is unaware of his gift until he meets Aylmer Vance. 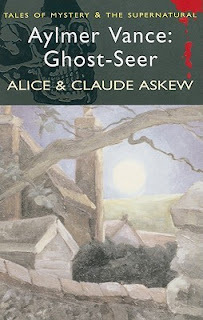 Wordsworth’s collection Aylmer Vance: Ghost-Seer includes eight Aylmer Vance stories. One assumes that these represent the authors’ entire output of such stories although it is impossible to be certain. Regrettably Wordsworth have not included an introduction, which would have been extremely useful in this case. The ghosts that Aylmer Vance hunts are not necessarily malevolent. Lady Green-Sleeves for instance is an entirely harmless and rather charming ghost. Other ghosts, as in the story The Indissoluble Bond, are more ambiguous. Even Aylmer Vance himself has to admit that some mysteries are beyond solving. They involve forces that are so little understood that they are destined to remain mysteries. Ghosts can also sometimes be manifestations of otherwise positive attributes, such as the creative spirit, in the story The Fire Unquenchable. Vance does not confine his investigations to ghosts; the story The Vampire deals, as its tile suggests, with vampires. In this case Scottish vampires. Vance also encounters a woman with the powers of a medium, and we discover that being a medium can be a very hazardous occupation indeed. Aylmer Vance has his failures as well as his successes, and success sometimes comes at a very high price. There are houses so haunted that the haunting can only be dealt with by razing the house to the ground. Most of the stories involve actual supernatural events, but in some cases there may be a rational explanation. Or at least there might be the possibility of a rational explanation. The authors are not overly concerned with wrapping things up neatly; they are content in some stories to leave a certain ambiguity about the ending. These are not stories to be taken too seriously. They were clearly written as entertainments and on that level they succeed very well. Fans of ghost stories and psychic detectives will find this to be a thoroughly enjoyable read. Recommended. Anyone interested in the life of the Askews should find the Ash Tree Press edition of this collection published in 1998. Jack Adrian discusses briefly their work methods, their "bulldog-like" attacks on work related projects, and their remarkable gift for marketing themselves and adapting to different genres. In 1917 while on business with the Red Cross in Serbia they perished when their ship travelling to Italy was struck by a torpedo. Nearly everyone on board including the Askews died. As for the Vance stories, it appears that these eight are the total lot. They originally appeared between July and August of 1914 in The Weekly Tale-Teller. A PI Mystery Movie Review: DEVIL IN A BLUE DRESS (1995). After 7 Years,11 Months And 4,106 Posts…..